Johnson & Johnson will pay $2.2 billion to settle charges that the company marketed drugs for unapproved uses and paid “kickbacks” to doctors and nursing homes. The penalties announced Monday involve fines and forfeiture to the federal government and several states. The settlement involves the schizophrenia drugs Risperdal and Invega, and the heart failure drug Natrecor, the company and Attorney General Eric Holder said. Johnson & Johnson and two subsidiaries “lined their pockets at the expense of American taxpayers, patients and the private insurance industry,” Holder said. The penalty amounts to one of the country’s largest health care-related settlements, the Justice Department said. It also results in what one plaintiff’s attorney called the largest whistleblower payout in U.S. history. Whistleblowers in three states will collect $167.7 million under the False Claims Act. In 2011, Johnson & Johnson (JNJ, Fortune 500) paid Arkansas $1.2 billion in fines for deceptive marketing and making false claims about Risperdal. The Arkansas case involved 239,000 violations of the state’s False Claims Act and 4,600 violations of the Deceptive Trade Practices Act. Risperdal was approved by the Federal Drug Administration to treat schizophrenia but was marketed to doctors and nursing homes as a treatment for elderly patients with dementia. 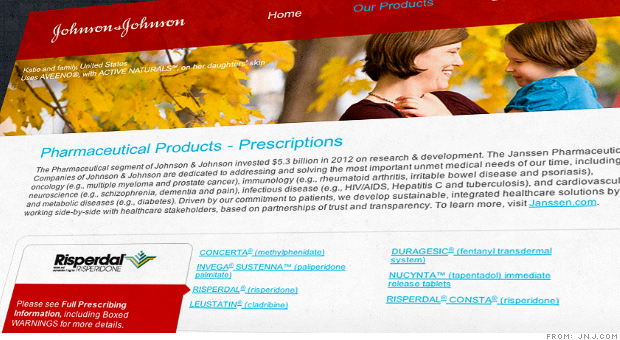 Johnson & Johnson subsidiary will plead guilty to a misdemeanor misbranding charge stemming from the marketing charges. The company knew patients on the drug were at increased risk for developing diabetes, but did not publicly acknowledge the risk, according to the settlement. The company also promoted the drug in nursing homes in part by sending paid pharmacists to review patient records. Johnson & Johnson and another subsidiary also marketed Risperdal and Invega as safe for elderly patients, a claim the FDA considered “misleading.” This was done in part through an “ElderCare sales force,” federal officials said. The heart failure drug Natrecor was marketed as a treatment for patients with less severe heart failure than mentioned in its FDA approval, according to the DOJ statement. The settlement includes payments to the federal government and several states by Johnson & Johnson, as well as subsidiaries Janssen Pharmaceuticals and Scios.